Banding with those engaged in similar activity has been an important part of professionalism through the ages. It has been done to improve skills and occupation, share knowledge and common interests - and, yes, for camaraderie with colleagues. You have a substantial investment in an exceptional profession, and a lifestyle that depends on the perpetuation of your job. Created in 1945, USCRA is the national representative for the federal court reporting profession. Together, you and we can do what neither can do alone. Join us today! CLICK HERE TO JOIN. Congratulations to our NEW FCRR recipients! Visit the Gallery of Shorthand. If you’ve ever wondered how to get an EIN, the Internal Revenue Service’s website has the information for you. You will need the Form SS-4, Application for Employer Identification Number and the Instructions for Form SS-4. Consult your tax advisor to find out if an Employer Identification Number is right for you! 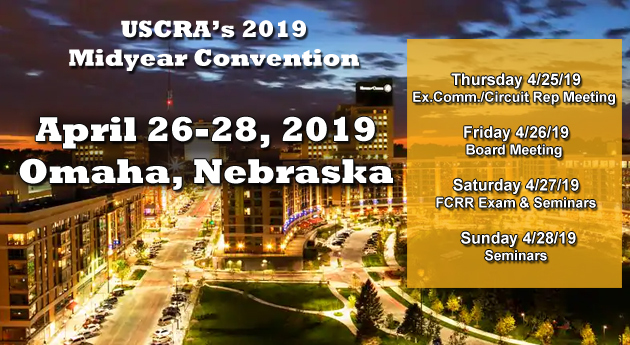 USCRA conducts board meetings and CEU-qualified seminars at its spring MidYear meeting and Annual Convention in autumn. And our quarterly publication, The Circuit Rider, contains articles geared to enhancing your career in the US District Court. We have several programs to help increase your income. USCRA offers four FCRR testing opportunities per year to obtain realtime certification, recognized by the AO for salary increase. FCRRs may also charge for realtime services. And our yearly Realtime Speed Contest Champion is awarded a cash prize in addition to bragging rights and a beautiful trophy. Other available monetary benefits are announced elsewhere on our website and in The Circuit Rider. Associate Members. Reporters outside the federal court system may apply for associate membership. All privileges of regular membership obtain, except voting and election rights. CLICK HERE TO JOIN. Supporting Members. Those not actively engaged in verbatim reporting, who are interested in the preservation of our profession and not otherwise eligible for CLICK HERE TO JOIN. Student Members. A student certified as being enrolled in a shorthand reporting program may apply as a student member. CLICK HERE TO JOIN. Interested in court reporting as a career? 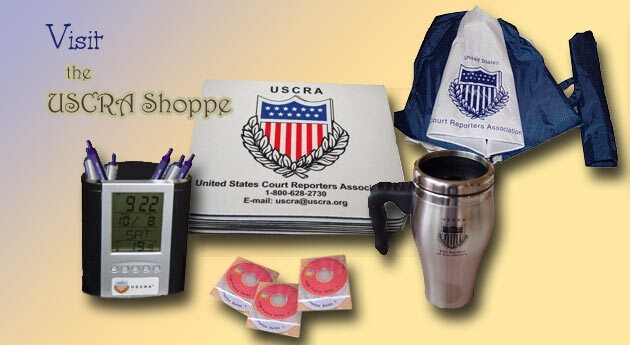 USCRA focuses its attention on matters that affect court reporters who work in the United States District Court. 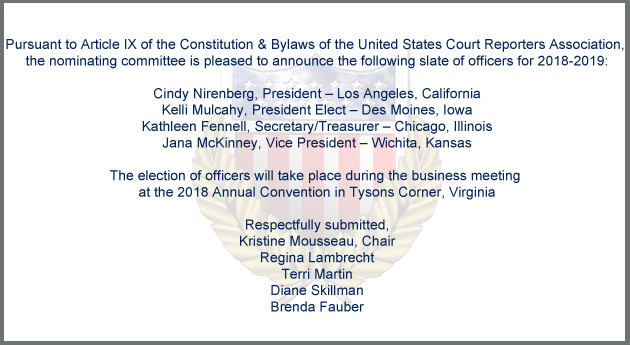 The National Court Reporters Association (NCRA) has a broader focus because they represent reporters working in all fields (i.e. freelance, deposition, official, captioning). In this capacity, NCRA maintains a list of certified schools. If you are interested in pursuing a career in court reporting, USCRA recommends you check out NCRA’s website at ncraonline.org. That will lead you to a page that outlines their certification process. You can also access their list of approved schools. If after reviewing NCRA's website you need further information about court reporting educational opportunities, we encourage you to contact them at their toll-free number, 1-800-272-6272.